Professional prop builders know a secret: audio is more than half of the experience of a high-quality prop. Until now, consumer-level audio boards lacked some professional features – things like quality amplification, as well as the ability to mix a stereo signal (to mono) right on the board. The AP-8 solves this problem, providing quality audio and amplification in a small format; a format perfect for amateur and professional prop builders alike. Need more than eight sounds? No problem – the AP-8 is addressable allowing up to four units to be attached to the same host (serial) connection. "...a dimension of sight, a dimension of sound, a dimension of mind..."; words of wisdom from a master of the macabre. Regardless of how you breathed life into your creation, you can easily add the dimension of sound with the AP-8. The AP-8 audio player allows you to easily record and playback up to eight sounds totaling 60 seconds. These sounds may be recorded in any order and played back in any order. Playback may be initiated with any microcontroller or normally-open switches. 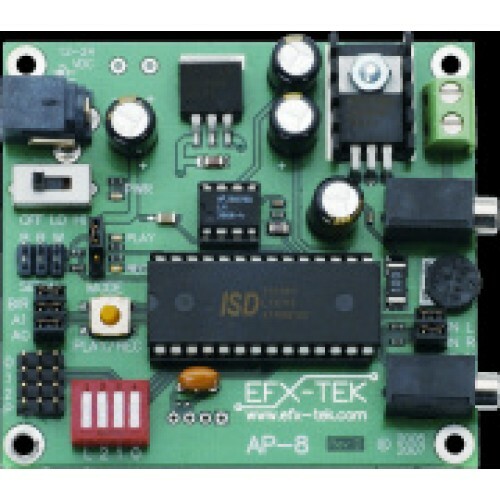 The AP-8 includes a dual-level (low/high) amplifier with variable volume control. When selected to level 1, the maximum volume is that of a child's giggle, and when selected to level 2, the volume range is locked into that of a blood-curdling scream!